Please introduce yourself to the readers, what is your background, how old are you and where are you from? I see you have a doctorate in some subject. My name is Eric Joseph. I’m 62. You can’t get to 62 without having done a lot of things. So asking about my background requires cutting out a whole lot, depending on how much time you have to. Here goes: My dad was a scientist for the US government overseas. So I was born in Germany. Moved to the US when I was 3 or 4 years old. Educated in Baltimore, Md., Washington, D.C., Chicago, Ill., and North Miami Beach, FL. Designer and Builder of Electric Guitars and Basses. Sculptor & Designer. Former K-16 Art Educator. Toy Designer & Model-Maker. I earned the Doctor of Education degree, specializing in Instructional Technology and Distance Education. I have put some of my expertise to work by designing my website, including the imagery, The Custom Guitar Blog, and a series of “How-To’s” – all of which are easy to find at the top of my homepage. An easy and entertaining way to reach out to people who have interests and feel deep emotional ties to all things electric guitar can be through a blog. Appealing to the visual learner, I try to clarify an idea or concept through an image or a series of images. A good example of this is my blog article The Making of the Flame Birch Lowrider Special. I credit my father more than any other person I’ve ever known for feeding my deep curiosity about the world. I remember looking forward to my dad always coming home from work with something interesting, something to study; a block of Plexiglas, a miniature, handheld spectroscope. He taught me how to identify various blood groups through microscopy and special slide preparations, when I was maybe 11 or 12 years old. So I learned from an early age that we’re quite capable of learning at various accelerated rates. Later on, after many years of experience as a teacher of students of all ages, it was clear that forcing children into age-based classrooms was an invitation to behavior issues. My graduation from the Baltimore Polytechnic Institute gave me a very good foundation for lots of things I guess. Among the areas of advanced learning were mathematics (solid & analytical geometry, algebra and trigonometry), physics, biology, technical drawing, wood, metal, and plastic shop. These subjects for the most part, were considered pretty standard college prep subject areas. Sadly much of this has disappeared in our public schools to the point where a child can actually graduate from an American public high school without knowing how to make something. Anything! I earned the Master of Fine Arts degree from The School of the Art Institute of Chicago. I have always been a wood sculptor. Even as a young child, I carved little animals like elephants and dogs. The smaller carvings gave way to bigger, more substantial sculptures, as I was entering my 20’s. Throughout this entire period, I developed an absolute fascination with the acoustic, steel string guitar. Starting lessons when I was about 11 or 12 years old. For how long has your career been making guitars, do you work alone and how did you start? My development as a sculptor and as a guitarist ran roughly parallel until about 10 years ago, when I started developing design concepts for electric and acoustic guitars. Anticipating my retirement from teaching and my children completing their undergraduate studies, I started developing my shop into the guitar designer’s space that it is today. I work alone but I’d love to be in the position to hire maybe 2 or 3 people who are skilled and ready to work. But there are clearly advantages to working alone. What kind of music/musicians do you like? My tastes have changed a lot over the years. I have a much greater appreciation for the jazz guitarist today than when I was younger. The music is the message for me now. The lyrics are secondary. I like rockabilly. If you could only display one guitar to represent your work which model would you choose? It would have to be the EJ Jazz Special-African Mahogany or else the EJ Jazz Special-California Redwood. And if you asked me why, I’d have to say that it’s because they are my most recent interests. What are your favourite guitars by other manufacturers and luthiers? I like the PRS 5-13 and I like the ESP LTD EC-1000 Deluxe. I like them so much that I bought one of each of them a few years ago. Beautiful and fun instruments to play. Where do you get inspiration for your guitar designs, materials, components and construction? That’s a question that deserves a good answer. But I’d be lying if I told you that there was a clear answer to that question. The answer lies more in shape and form. Wood grain and density are a great influence on me although I can’t tell you how or why I get the results that I do. I design an instrument as if I’m making it for myself. That’s the standard. With experience, one becomes sensitive to criticism from players. With maturity, one listens to others and to oneself. Then answers become more clear. Comfort, ease of playing, balance (in a physical sense) all come into play. If a design looks good but the instrument is difficult to play or just feels foreign – It’s a bad design. A good designer needs to know when to say no, and when to say yes. Aesthetically speaking, I am not going to play an instrument that turns me off. Aesthetics matters a great deal. When you go into a guitar store, what is it that makes you stop, look, touch, and play? I think your pricing is fantastic, is it part of your philosophy to not make your guitars out of reach of regular people? I wish that I could give myself that much credit. The truth is a combination of accessibility to regular people who aren’t rich and the fact that the more instruments that I get out there, the more widely known my brand becomes. My current pricing- if I don’t change it, I will go out of business. The prices are impossible. Hopefully, my reputation will reach a point where I can move the prices up, and the clientele will accept the pricing. I have to compete in terms of quality, uniqueness of my product, and my reputation. I will never be able to compete with quality instruments coming out of the far east selling for $300.00. What is the best tip you could give to would be guitar makers? Make sure of your motives. If you can legitimize your pursuit in your heart and mind, then you should continue your work. If your intent is to make a living, make sure that you have a backup plan. What part of being a luthier do you enjoy the most? When I’m beginning a project, selecting materials, and not quite ready to commit to a design. That’s the best time. I guess it has to do with making critical choices and making the right critical choices. 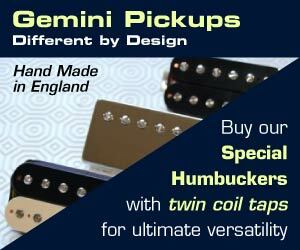 Do you have favourite pickups and amplifiers to complement your guitars? I sure do! Pickups, other hardware, and amps. I really like the Seymour Duncan stacked P-90™ neck pickup & Dimarzio Tone Zone P-90™ bridge pickup. My favorite amps are my ’65 Reissue Fender Twin Reverb and my Roland VGA-7. They’re keepers. Please let the readers know about any new guitar designs you have in process. Mahogoney and leopardwood Jazz model> Seymour Duncan stacked P-90™ neck pickup and Dimarzio Tone Zone P-90™ bridge pickup. This is a recurring theme on GDR – do you foresee any major changes in the electric guitar market in the next 50 years? 50 years is a long time. What I see happening now a lot of plug and play components. Solderless construction. More (much more) use of sustainable wood species from sustainable sources. I have wood that is over 40 years old. My “stash” of wood for future projects is pretty good for maybe a few more years. I’m always on the lookout for materials. Please share your favourite guitar anecdote. That’s the end of the interview folks. I hope you have all enjoyed Eric’s insight and advice. There are lots of links to follow in his answers, be sure to click through and have a look at his own site and blog. Coming next on GDR should be some reviews. I have a couple of compressor stomp boxes to compare and also 3 or 4 overdrive stomp boxes. That’s a lot of stomping coming up! Like us on Facebook for more stories, articles and discussions!